UN Secretary-General Antonio Guterres says he fully supports Nickolay Mladenov who is being boycotted by the PA.
UN Secretary-General Antonio Guterres on Friday expressed support for the UN’s Special Coordinator for the Middle East, Nickolay Mladenov, a day after the Palestinian Authority (PA) declared it would no longer work with Mladenov. 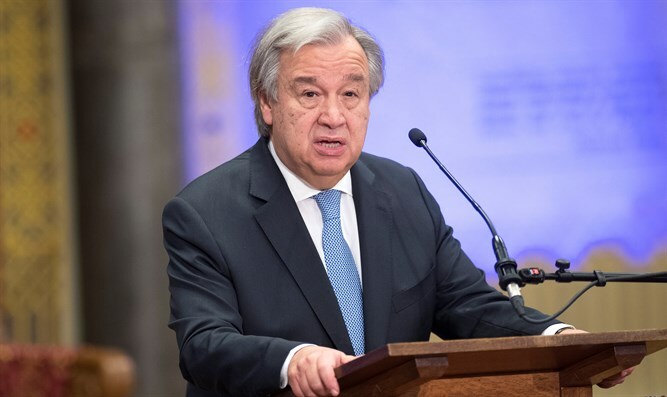 “I can say that the UN Secretary-General fully supports the efforts of Special Coordinator Mladenov, who has been working tirelessly with all concerned parties, particularly with the Palestinian Authority, Egypt and Israel to change the dynamics in Gaza - to avoid escalation, to support intra-Palestinian reconciliation and to address all humanitarian issues,” Guterres’ spokesman, Farhan Haq, told reporters. “The Secretary-General hopes that relieving the humanitarian pressure in Gaza will reduce the tensions that risk a devastating armed conflict in Gaza and create space for the Palestinian Authority and Hamas to engage seriously with Egypt on reconciliation and the implementation of the October 12, 2017 Cairo Agreement. However, any humanitarian response to Gaza’s problems can only be temporary and limited in scope. What is needed is a political breakthrough that will restore intra-Palestinian unity under a single, legitimate national authority; a lifting of the closures in line with Security Council resolution 1860; and, ultimately, progress towards advancing a negotiated two-State solution based on relevant UN resolutions and previous agreements,” added Haq. On Thursday, the PA leadership announced it will no longer work with Mladenov, accusing him of overstepping his role by seeking a deal between Israel and Hamas. Ahmed Majdalani, a member of the Palestine Liberation Organization's (PLO) executive committee, said Mladenov had "gone beyond his role" in seeking agreements between Israel and Hamas, which controls Gaza, and asserted his actions impacted "Palestinian national security and the unity of our people." The PA has repeatedly criticized those talks, with one report indicating that Abbas had threatened to cut all contact with Israel, should the Jewish state reach a ceasefire agreement with the Hamas terrorist organization. The talks have stalled, partly due to the pressure form Abbas, but on Tuesday a smaller UN-brokered agreement was reached for Qatar to finance much-needed fuel deliveries to Gaza for six months. The conflict between Abbas’ Fatah faction and Hamas has been ongoing since 2007, when Hamas violently took control of Gaza from Fatah.